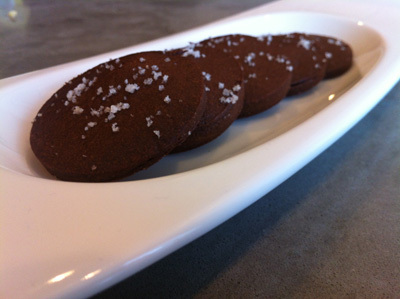 This recipe is a very special one that I’ve given a modern update to. When we lived in Geneva, we had an apartment in a quaint area of town known as Carouge. 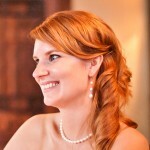 Right around the corner from us was what I consider one of the best restaurants in all of Geneva, La Huchette. This restaurant was famous for its wood grilled steak, but also had an amazing chocolate brownie with crème anglaise they’d always prepare if they knew we were coming. On our last night in Geneva, we were able to obtain the hand written recipe en francais which I’ve translated and posted here. To give this recipe a bit of an update, I’ve taken her original anglaise ingredients and cooked them sous vide. 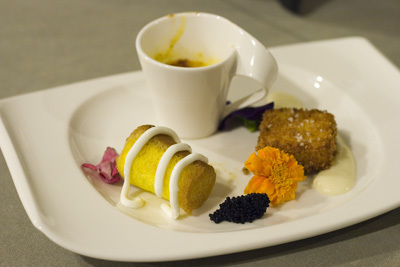 If you’ve never made Anglaise sous vide, after this you’ll never go back. It’s so incredibly simple yet results in the densest creamiest anglaise I’ve ever seen. 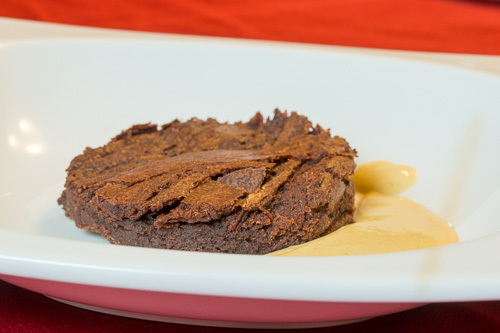 Together, the chocolate cake and sous vide crème anglaise is incredibly rich and decadent, but it’s totally worth it. 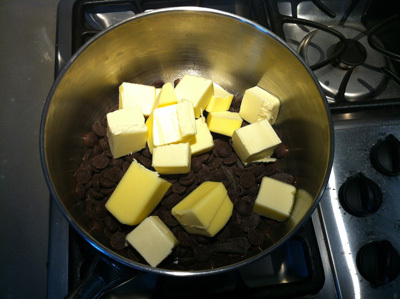 Melt the chocolate and butter together in a double boiler over simmering water. 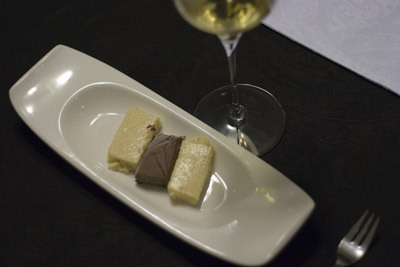 Be sure the water doesn’t touch the bottom of the bowl or it might scorch the chocolate. Once the mixture is fully melted and combined, remove it from heat and whisk in the flour. In a separate bowl, whisk together the sugar and eggs until light and fluffy. 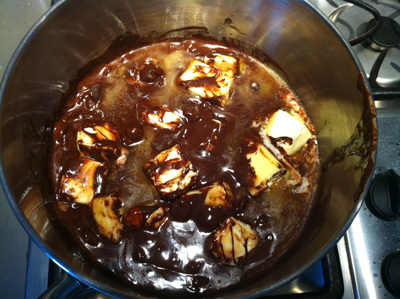 Whisk the sugar and egg mixture into the chocolate until it is evenly dispersed throughout the mixture. 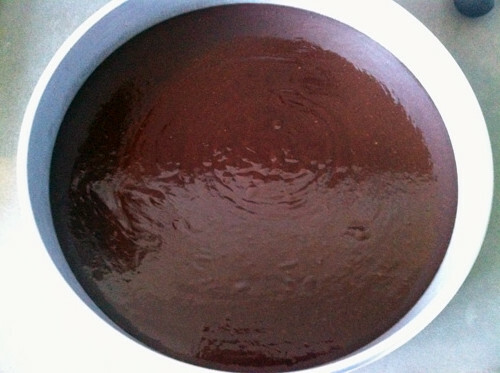 Pour the mixture into a 13 inch cake pan. Bake on the center rack for 13 minutes. 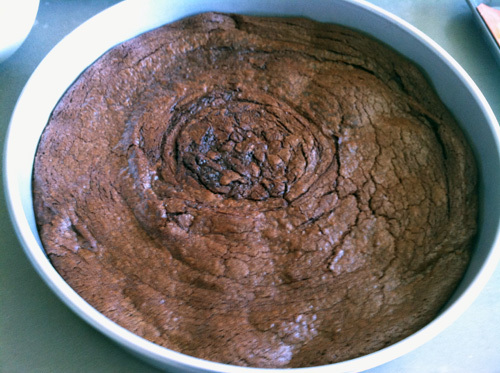 Turn the pan 180° and bake for another 13 minutes. 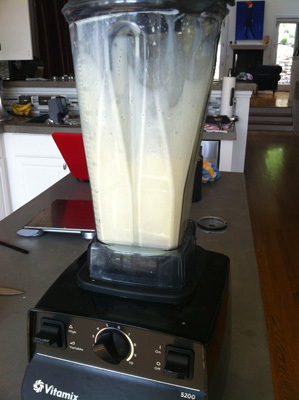 Place the egg yolks, milk, cream, sugar, vanilla bean seeds, and salt into a high speed blender (do not put the vanilla bean pod in) and blend on high for 30 seconds. 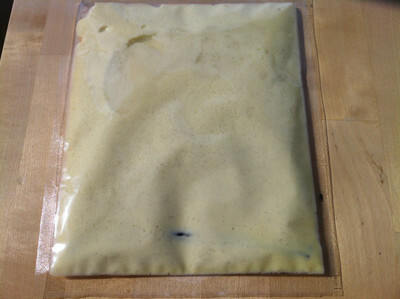 Pour the mixture into a vacuum bag, add the vanilla bean bod, and seal using a chamber vacuum sealer or the displacement method. Cook the anglaise for 20 minutes. Do not cook for more than 25 minutes or the mixture may begin turning eggy. 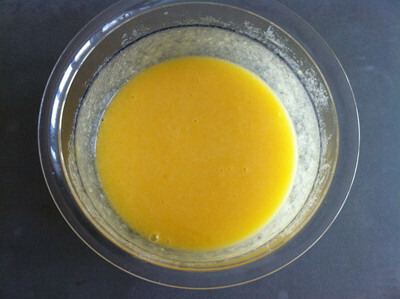 Remove the anglaise and massage it for a few minutes (try wrapping it in a kitchen towel so as to not burn yourself). This will keep the anglaise from forming lumps and will ensure the vanilla beans are evenly distributed. 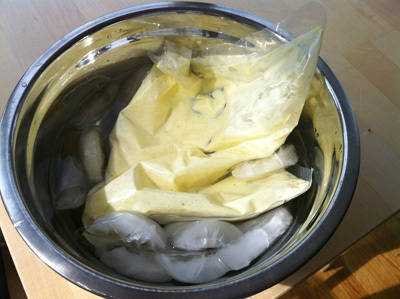 Cool the anglaise in an ice bath. As it chills it will thicken significantly.